No, not Charlton Heston. The only pudding he ever made was steak and kidney. 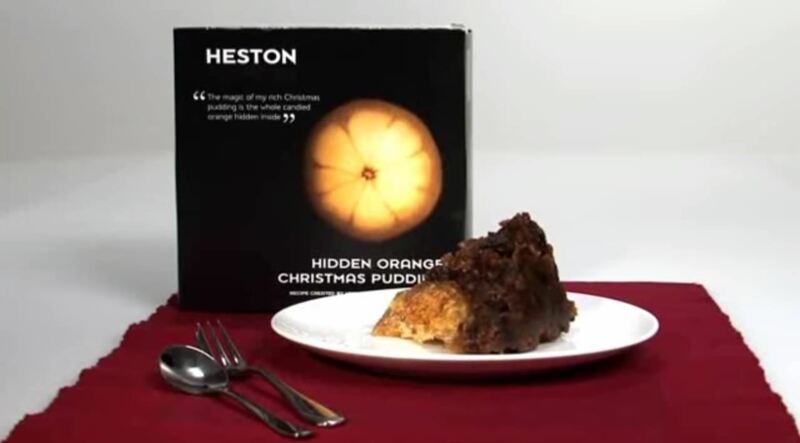 I'm talking about Heston Blumenthal, world famous chef and pudding lover, and the man behind the "Heston"— a plum pudding with an orange hidden within, brought to you by Waitrose (see video below). As of right now, the Waitrose supermarket in the United Kingdom is completely sold out of their notorious Hidden Orange Christmas Puddings— all 25,000 of them. If you can believe it, those lucky enough to have grabbed a few are not going to be selfishly digging into its exquisiteness this holiday season, they'll be selfishly digging into your pocketbook. And where does one go to get your hard-earned money? The Heston has a regular retail cost of £13.99 (~$22), but the lowest price found on eBay right now is around £60 (~$95). Some Buy-It-Now prices are as much as £300 (~$475) and one was being auctioned off in the name of charity for £1,000,000 (~$1,585,800). And don't forget shipping. But wait... there's still hope for all of you pudding lovers yet. Make it yourself! Rose Prince, Telegraph Food Writer, tackles the secret recipe in her own kitchen and shares with us the recipe for the infamous Christmas pudding with a hidden candied whole orange. If you've tinkered around with pudding before in the past, you should have no problem recreating this elegant dessert. Actually, it's not exactly the Heston, but it's close enough. Close enough to save £1,000,000. Rose used her favorite pudding recipe, along with some instructions she hunted down for candied whole oranges, to make this delicious version. "Candying fruit is the alchemy of southern European confisseries; my take was to boil the orange in a spiced syrup for 1 hours, cool on a rack then boil for another 30 minutes. By the end I had a satisfyingly soft, sticky orb. I squished it into the middle of the raw pudding mix in the basin then steamed the whole thing for 7 hours." Check out the video below, then full recipe after that! Place in a pan to steam with 4 cm depth of simmering water. Cover and steam for 7 hours. You can then store the pudding for several weeks – before steaming again for 3 hours for the Christmas meal. Serve with buttercream flavored with Grand Marnier, or clotted cream. Click through to see the original recipe. After boiling the orange for the first time, the recipe should have said retain the syrup for boiling the orange again the next day. This really looks worth trying.